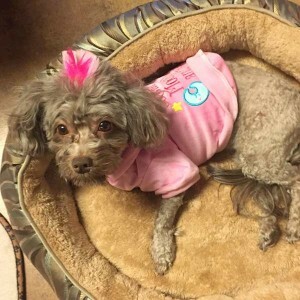 Tripawds Community member thurston is recipient #48 of the Maggie Moo Fund for Tripawd Rehab. 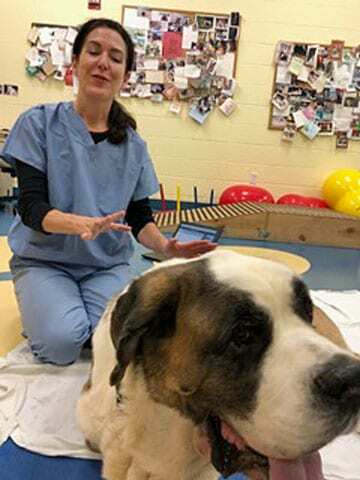 Read on for details about the benefits of canine rehabilitation for three legged Saint Bernard Thurston. We are thurston.tripawds.com and found the Tripawds community and foundation when I was looking for other large breed dogs who might have had amputations. I have learned so much and am so grateful. All of our treatments were done at University of Wisconsin. Mostly because I wanted to be part of their clinical trial. Thurston is a floppy dog (see our blog) and thankfully he was never really adventurous or liking to go for walks or hikes. Instead he prefers a nice nap. He is a 6 year 2 month old St Bernard who was diagnosed with Osteosarcoma 4/22/28 at age 5 years 8 months. His amputation was done on 5/11 and he received 4 doses of carboplatin over the next 2+ months, then was part of a clinical trial all at University of Wisconsin. He was from a breeder and I got him at age 2 months. This diagnosis broke my heart. Especially when the first veterinarian suggested I not treat it. He was 185 pounds and “Since large breeds carry 60%+ of their weight in front, he wouldn’t do well”. WRONG! After his amputation he “popped right up” the next day and over the course of the next few weeks his strength improved and I swear I don’t think he even misses his right front leg. I was so proud of him and so happy to see him doing well that I encouraged him, perhaps a bit too much. That is precisely the reason I am so glad that Rene at Tripawds suggested a PT evaluation. Courtney at UW suggested I focus on his SAFETY, an area I may have been neglecting in my excitement that he was doing so well. She advised me to keep my bedroom door closed because Thurston is able to jump onto the bed and may hurt himself if he attempts this without supervision. She encouraged me to use the HelpEmUp just to keep him used to it in case he ever needs it again. No specific exercises were prescribed but that was because he is pretty independent at this stage and we were more concerned about hims safety. He is way stronger now after 6 months and no longer needs to use those rubbery granules I stuck on his paws immediately after the amputation. I have removed all the mats/throw rugs that I used in the beginning. Courtney suggested the use of PAWz dog booties as he sometimes slips on the ceramic tile in the kitchen. The best part of the whole experience was that she suggested and demonstrated massage for him. His muscles did show tightness. He loves it and it really helps him to relax. As you can see in the photos, he enjoyed his experience and he is getting the benefits from it at home, as we follow up with the massage. I think that the most important thing we got from this experience was about the safety questions I had and seeing and discussing Courtney’s observations. This increased my confidence and made me more aware of the fact that even though Thurston is doing so well, he still has limitations and that I need to be cognizant of those limitations even if he is not. I really appreciate Tripawds and the blogs and being able to share Thurston’s story. In addition I appreciate Rene helping me all along the way. Giant breeds CAN be great as tripawds and that first vet who told me not to treat him is now VERY happy he was wrong!